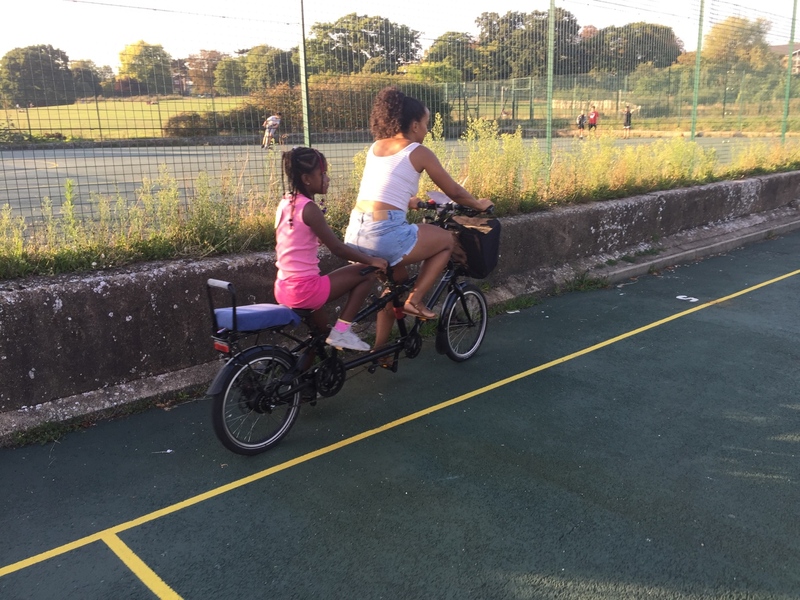 Hundreds of people took two wheels (or sometimes three or four) on Sunday 2 September, in the try-a-bike area of Palmers Green Festival. Run by Enfield Cycling Campaign and Better Streets for the council’s Cycle Enfield scheme, the annual Try-a-Bike had its busiest year yet. 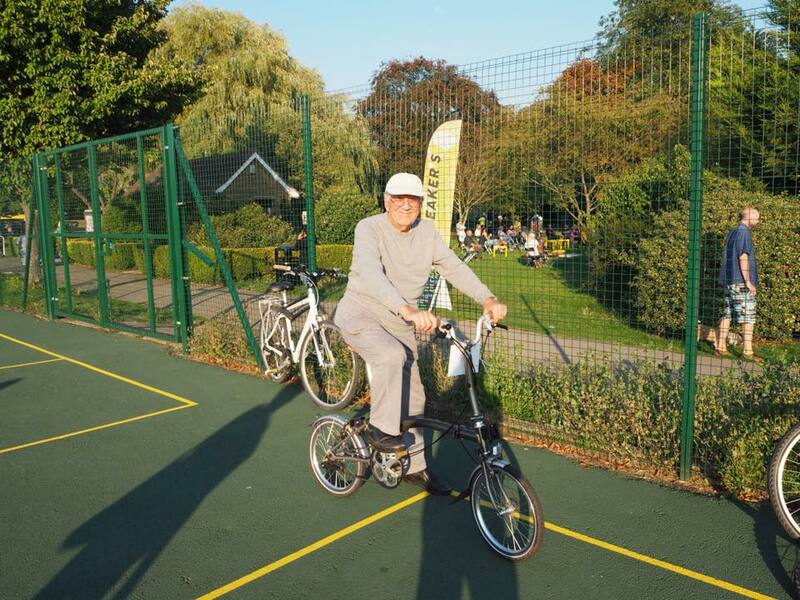 By the end of the day close to 400 people of all ages had pedalled around Broomfield Park’s tennis courts. There were 29 bikes on offer, including e-bikes, folding bikes, bike trailers, a tandem for three (remember the Goodies?) and a Dutch ‘cargo’ bike to transport up to four children. 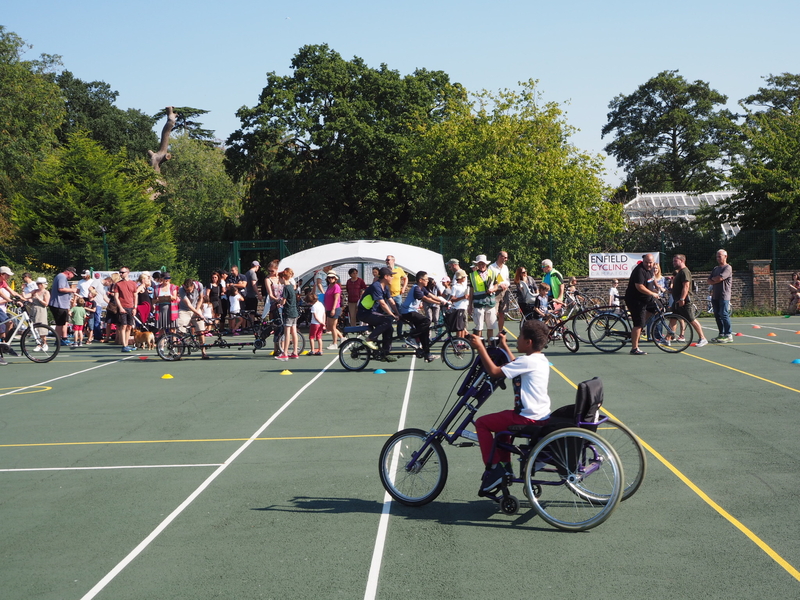 An adult trike and handcycle were loaned by the council’s inclusive cycling scheme at Bush Hill Park, and a range of Frog bikes for kids were supplied by Muswell Hill Bikes shop. 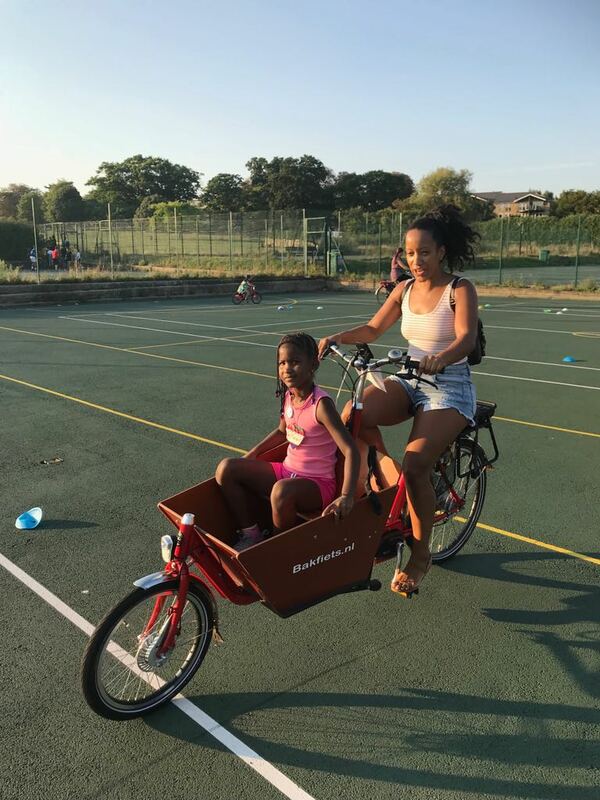 However, most of the cycles were lent by members of the community, thanks to a Facebook appeal by ECC’s sister campaign, Better Streets for Enfield. 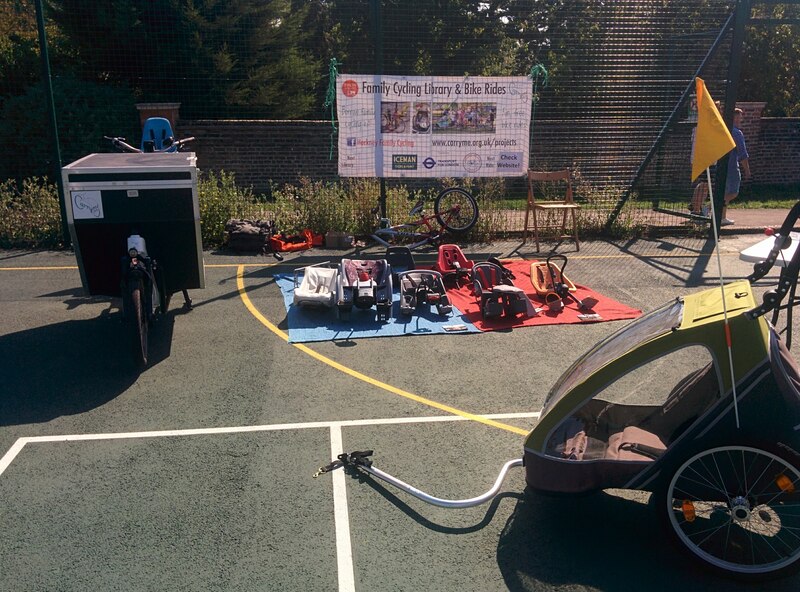 New this year was the Hackney Family Cycling Library, displaying accessories for carrying kids by bike. 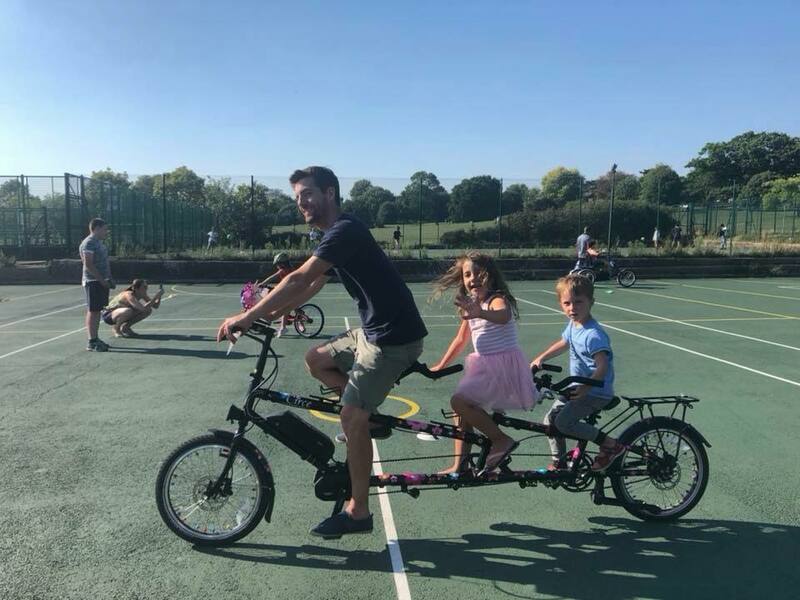 ‘Librarian’ James Holloway advised around 50 families on the day, demonstrating child seats, trailers and tailgator bars (to tow a child’s bike behind an adult’s). A lot of the families who saw the range of kit on offer said they’d like to see an Enfield Family Cycling Library – something we are talking to the council about. Demand was so high, at times people had to queue to let one of the four supervisors bring them their preferred bikes. The amount of time each rider had was sometimes rationed too – particularly for the children enjoying the Frog bikes. After lunch the largest queues were for the cargo bikes. It was impressive how patiently people were prepared to waited for their chosen ride. The electric bikes intrigued the older attendees (as well as a couple of young lads). People returning to cycling was also a theme of the day – including a gentleman who was keen to get on a bike after many years. For us as organisers, running this event has a serious purpose as well as providing a lot of fun. It shows people a practical, healthy and non-polluting alternative to the car for short journeys. 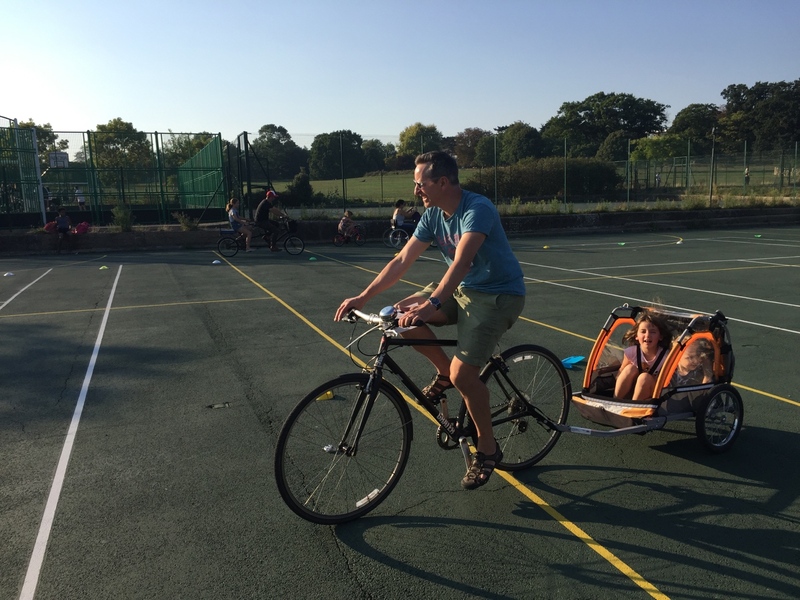 Imagine if Enfield’s school run were done by cargo bike, trailer and family tandem instead of by car… wouldn’t that make for better streets for everyone? Thanks to Paul Findlow, ECC Secretary for liaising with Cycle Enfield and all the ECC/BSfE members for helping out on the day – it was a genuine team effort. The Frog bikes were provided by their North London suppliers, Muswell Hill Bikes.